The official beer of the 2018 FIFA World Cup, Budweiser has launched its new campaign “Light Up the FIFA World Cup” with major highlights of the campaign featuring the largest beer delivery to date and a selection of integrated experiential, digital and social programs happening worldwide. Why go to the concession stand when a drone could deliver your next beer? 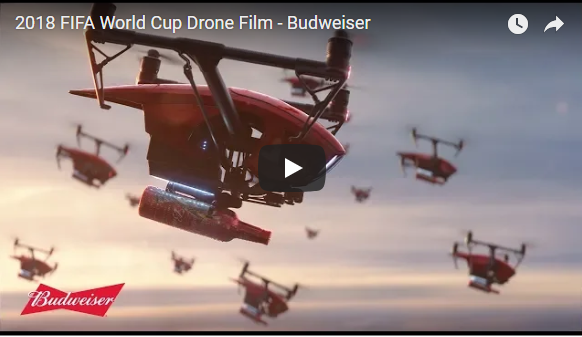 That’s the future Budweiser imagines in its World Cup ad, which depicts Buds delivered by drone to thirsty fans at a soccer stadium in Russia, site of this year’s Cup. Featuring the journey of thousands of drones as they carry Budweiser from St, Louis brewery to Lagos with the ultimate goal of delivering a stadium full of fans in Moscow, the commercial highlights the most ambitious beer delivery ever through a variety of creative executions that show how Budweiser is upping the energy levels of fan’s football celebrations worldwide as the official Beer of the 2018 FIFA World Cup. The spot by Anomaly New York is part of what Anheuser Busch InBev describes as the largest campaign in its history when measured by investment and reach, hitting more than 50 countries. But with the U.S. team failing to qualify for this year’s Cup, Budweiser and other sponsors face a tough call on how much energy to put behind campaigns in the States, where TV ratings could be hurt by the absence of the home team. Budweiser will not run the TV ad here but still plans to deploy special packaging, digital, experiential and out-of-home advertising. “The U.S. continues to be an important market for us—it’s our brand’s home market. But our World Cup campaign will be more limited here,” Brian Perkins, VP of global marketing for Budweiser, said in a statement. “However, given the global reach of the FIFA World Cup, this campaign is bigger than any one market,” he added. The brand is focusing its media support in China, Brazil, India, U.K., Russia, as well as countries that Bud has recently entered, including South Africa, Colombia, Nigeria, Ecuador, and Peru, he said. The Cup considered the largest sporting event in the world, runs from June 14-July 15. Fox Sports, which will broadcast the Cup in the U.S., has sought to spur interest with its “Root for Your Roots” campaign. The effort, in partnership with genetic-research firm 23andMe, encourages viewers to back the team with ties to their ancestral origins. While Budweiser’s TV ad won’t show in the states, the brand’s St. Louis birthplace is featured in the spot as the starting point for a fictional drone journey across the globe to Russia. In the extended cut, a wayward drone dubbed Bud 1876 finds its way to a beerless fan at Moscow’s Luzhniki Stadium. The spot is directed by Jake Scott, who has previously teamed up with Anomaly on Budweiser Super Bowl ads.